Made for the ultimate in comfort, this chair and ottoman set provides you with a unique balance of plush looking cushions and intricate detailing. The cushions are large and plush, giving support and comfort, without feeling like a plank of wood, while the wood peg legs and the nail head trim provide intricate details that compliment itself and the room that it's in. The Stanton Chair and Ottoman Set with Nail Head Trim and Wood Accent Legs by Lane at AHFA in the area. Product availability may vary. Contact us for the most current availability on this product. 863-16 Stationary Chair 1 57" 40" 43"
863-17 Ottoman 1 40" 28" 20"
Fabric Content To draw your attention, a fabric has to be durable as well as beautiful. All of the leathers and upholstery fabrics are tested to ensure durability over many years of use. 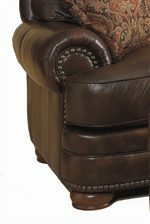 The seams are reinforced to extend the life of your upholstery. Frame Construction All hardwood components are made from kiln-dried lumber, double-doweled, glued, corner-blocked, and incorporate 8-gauge steel action brace construction. The pitch and size of each piece is engineered for generous comfort. The Stanton collection from Lane provides comfortable style that will last you years. With a design focus on application to most homes, the collection has intricate details that let it fit in with sophisticated rooms, but keeps its down-home feel with the large design features. The Stanton collection is a great option if you are looking for Casual furniture in the area. Browse other items in the Stanton collection from AHFA in the area.